As Elliot Goblet I’ve done over 100 weddings mostly as a wedding master of ceremonies so happily in this area I’m now on the way to my second century. (1) A great wedding MC should check the proposed run sheet before hand and if necessary make constructive suggestions. (2) A great wedding MC should add humour around all the formal duties from introducing the bridal party right through to getting the guests to form the goodbye circle at the end of the reception. (3) A great wedding MC should be aware of sensitive issues such as any absences of family members or conflicts between/within families. And ideally the MC should avoid reference to these sensitive issues. 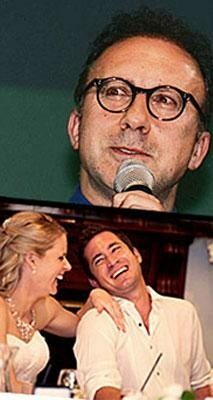 (4) A great wedding MC should prepare tasteful funny material specifically about the bride & groom. (5) A great wedding MC should ensure that the audience is kept entertained especially during flat periods…for example following speech makers who are a bit on the dull side. The MC’s comments here again need to be tasteful. (6) As the person effectively controlling the proceedings, a great wedding MC should have a good rapport with all others working in the team including the venue manager, video & stills photographers and the band or DJ. (7) Some hired MC’s want to exit after a couple of hours. A great wedding MC will ideally stay for the duration of the wedding reception and happily mix with the guests in between the formal parts. Apart from being very good behind a microphone a great wedding MC should be people friendly. (8) A great wedding MC should participate in the fun of the day/night including an appearance in the photo booth with bride & groom if requested. (9) A great wedding MC should make that special day even more special.